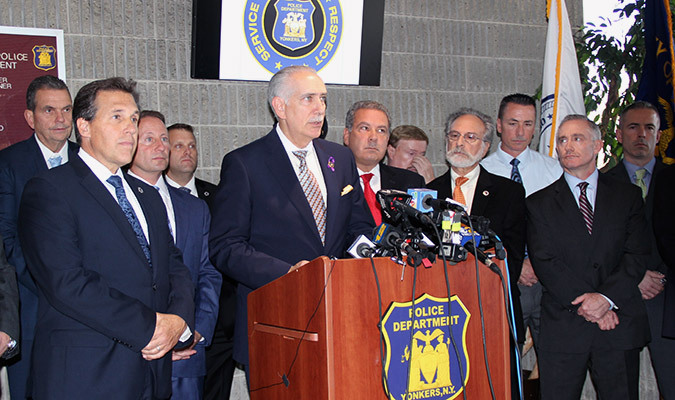 Westchester County District Attorney Anthony A. Scarpino, Jr. today announced the arrests of numerous suspected drug dealers who were arraigned on Felony Complaints in connection with street-level heroin and crack cocaine sales in the City of Yonkers. A total of 31 offenders were targeted in the citywide sweep, with 25 defendants apprehended and another six offenders still at large. DA Scarpino said this sweep targeted street level drug dealers who were selling primarily heroin and crack cocaine. Undercover officers from the Yonkers Police Department, the Westchester County Department of Public Safety, and the Putnam County Sheriff’s Office were utilized during this operation. The Yonkers Police Department, along with the DEA, made multiple buys through these dealers in roughly half the cases which started in May of 2016 and continued into May of 2017. According to DA Scarpino, the defendants include one individual with approximately seven felony narcotic sales in his criminal history, and another with an Attempted Murder conviction from the mid 1990's. These cases are being prosecuted by Assistant District Attorney John O’Rourke, Bureau Chief of the Gangs, Firearms and Narcotics Bureau and Assistant District Attorney Craig Cecchini, Deputy Bureau Chief of the Narcotics Bureau.